Cook Yourself Young written by Elizabeth Peyton-Jones is a simple to understand, useful book to have. Since the food we eat and our body is connected, what we eat makes a big difference on how we feel. If we want to feel fresh, awake, vibrant, and inspired then we have to watch what we eat! A balanced diet and exercise is fundamental to keep our body healthy. The recipes suggested by the author helps us to decelerate the aging process and boost our immunity, while enjoying tasty, healthy food. To start healthy eating habit, here are few tips from the book we can follow. Dropping addictive food that are processed, refined, and have hidden sugar, salt, and bad fats. The way we prepare our food affects its nutrition and youthing benefits. Eating more nuts, by soaking it overnight has benefits. Washing our internal body everyday by drinking 2 cups of warm water with a whole lemon squeezed in it, we can add ginger or green juice as well, or drink a cup of juice blended with beets, carrot, ginger, spinach, and lemon. 40% of food we eat needs to be raw in its purest form such as salad, green juice, salsa. Using kitchen tools that are made with nature based utensils such as wooden, ceramic, glass, straw, cast iron, stainless steel, and enamel coated pans. I enjoy using nature based utensils when I cook and bake, as I find the food is tastier. 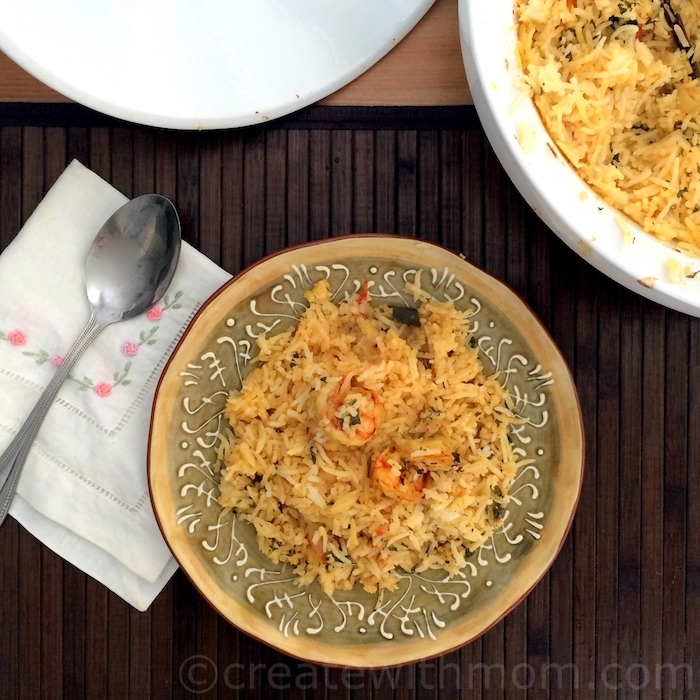 I made this shrimp spiced biryani in the 24oz white porcelain Tajine that allowed the rice and shrimp to cook slowly and make the meal flavourful. This Tajine from Danesco can be used in the oven and microwave. It is also dishwasher safe. I like that we make it a beautiful presentation by serving this one pot meal directly out of this Tajine. 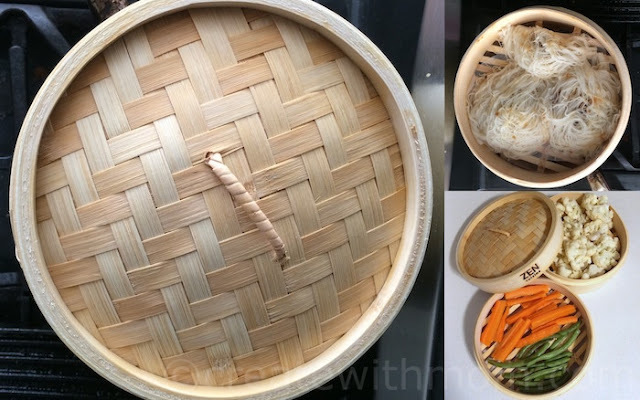 I like using the 2-tier Bamboo Steamer from Danesco to steam a variety of food. The two 8" baskets can be stacked to accommodate different foods in each level, and I find that its domed lid efficiently traps the steam. Since the steamer is made with 100% natural, renewable bamboo it adds a delicious flavour to the steamed vegetables and other meals I make in the steamer. I like how the author in the Cook Yourself Young book explains how our bodies react to certain food, and how we can prepare healthier meals. This book is detailed and the recipes are flavourful and easy to make. Here is a recipe to make French Onion Soup from the book. Steam fry the onions with the coconut oil stirring frequently for about 15 minutes until it has softened and caramelized. Add the thyme leaves, then pour the broth and bring to a biol. Reduce the heat to low and simmer for about 10 minutes. Season to taste and serve with cheesy toast. This soup is easy and flavourful to enjoy for dinner. Interesting book. I like that coconut oil is used as a cooking oil. I have never cooked with a bamboo steamer before but will try it. Recipe sound good. I use a bamboo steamer occasionally. I'll be trying out this recipe...it sounds great! Really great tips. I've always wanted a bamboo steamer! Those dishes look fabulous ... and I could always be younger too. Thanks so much for sharing this terrific recipe! An interesting book. I love trying new recipes. These are some really good tips, especially getting a bamboo steamer. Thanks for the great tips! I'm trying to incorporate healthy eating into my life so these tips are very welcome! What a great cookbook! I love the idea of healthy cooking, and books like this make it possible! And the best thing is, all those photos of the food look wonderfully delicious! Oh, I would love this cookbook! This soup looks so good. I would love to check out this book. Anything that will help me look and feel younger is something I am interesting in. Interesting, I agree with a lot of the points given. Will have to read more. Sounds like a great book and that onion soup reciue sounds delicious. I`ve never made onion soup before. Sounds like a pretty good cookbook to have, I need some new recipes to make!! It makes sense that what we eat and how it's prepared would make a difference to our health. I'd like to get this book so I can read more about it and try the recipes. i like the cookbook! would be great to make some of the recipes! Looks delicious. I would love to give it a try. Hey this would be a great book for my youngest sister, who's just started out on her own. She doesn't cook for herself often enough, this could help that. Great tips in this book! I'm actually going to try frying onions in coconut oil from now on. Sounds absolutely delicious. These recipes sound so good! I have just stared using more recipe books and "cooking more" for myself and LOVING itu! OOO I could totally use a bamboo steamer! love those. A good book to help people to start eating healthier. The recipe looks great, and the book looks great too. Gosh this books sounds really good. Love healthy recipes. I love French onion soup. I've never tried it with coconut oil - definitely going to have to try that! I would love to cook not only to feel younger but feel better in general. I've been looking for more healthy food. The recipes sound delicious. Great tips. Must try drinking 2 cups of warm water with a lemon squeezed in it. Great tips. I love French Onion soup. I'm going to try this recipe sometime. This cookbook sounds very interesting and am going to order from library to check it out. My husband loves French Onion Soup and will try this lighter version for him. I like the tips for eating healthy and the soup recipe. Sounds like it is a great cook book ,a yummy recipe love to try it ! This seems like a very good book. I'm horrible at eating healthy, I think. Sounds like a interesting cookbook. I sure know I could use a boost to look younger!! I'm always looking for new recipes and this one sounds wonderful, thanks! What a wonderful book! I truly believe you can eat yourself to good health! I'd like to have this book! Sounds good. I really want this cookbook. Anything that can help improve my skin and hair is awesome in my books. Besides, the recipes sound delicious! Sounds like a great book! I fully believe that our diets can affect our body and how we age. I will be checking it out! This recipe sound delicious. I love trying new recipes, especially soups. I love cook books, always good to get some new ideas. It sounds like there's good advice and great recipes in that book..I'll have to check it out more closely! Mmm! that recipe sounds really good and some great advice too! I now want a bamboo steamer! Great recipe! thanks for writing about this book; can't wait to try it. I would love to try some cooking with a bamboo steamer.The cookbook sounds great too! Wow. What delicious looking recipes! I would love to try the recipes in this book!! It looks so lovely. I will try the recipe. Thank you.